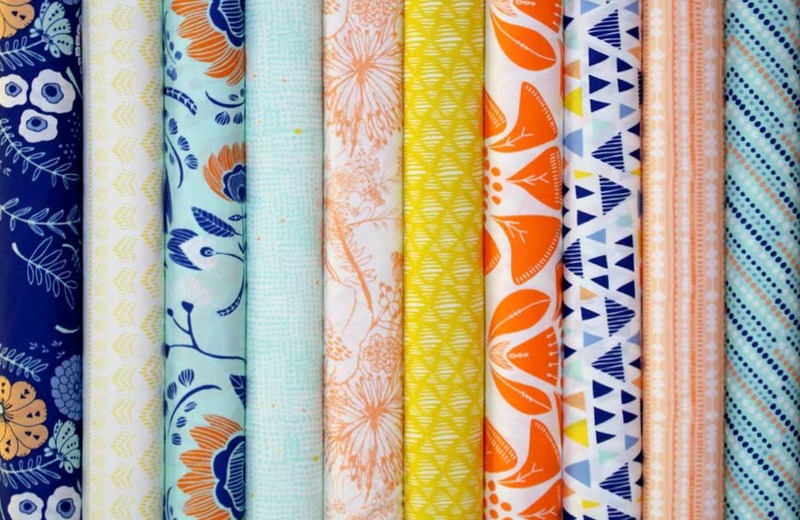 For this week's Fabric Giveaway, Julie at The Intrepid Thread is offering a Fat Quarter bundle from the brand new, gorgeous Tule fabric collection by Leah Duncan for Art Gallery Fabrics! This bundle includes all of the ten prints that make up the Nevada Sun Colorway. You can find this collection newly available in yardage and in a variety bundles right HERE in The Intrepid Thread Shop!! That’s 4 possible entries! Enter now through Monday, September 16th!! Winner will be picked at Random and I will announce their name at the bottom of this post, here on the blog. Congratulations!!! I will be in touch shortly! Hmmmm...I'd scour my Pinterest boards for hours until I rediscovered the perfect project. Thanks for the opportunity! And I follow you in Feedly. Love this fabric! I would make some quilted totes with it. love this fabric! want to make a quilt with it. I want to make a twin siZE wall hanging to hang behide a new bed. Fan of Intrepid Thread for several years now. Oh I love this fabric and I have put in place a buying ban so this would be great!! I would definitely make something for meeeeeee! I follow Intrepid Thread on FB as Deborah Davey. I want to try my hand at a medallion quilt and this fabric would be perfect. Thanks for the giveaway. I'd make a quilt with pillow cases/shams to match. these are gorgeous prints!!! i would love to try some small quilting projects to get me started - maybe placemats and potholders, etc. I follow IT on FB. They have great ideas. I follow you on FB and newsletter. I have a paper piecing quilt I would like to make. I am really into Ohio stars at the moment. I can see the lighter colours done like that with borders gradually getting darker. Love these fabrics. Lovely crisp colours. I can see a few of these making nice summer dresses for my grand daughter. I liked (still!) the Intrepid thread on facebook! I'd use these fabrics as part of the bright nad cheery throw quilt I want to make for our living-room futon! I would make a beautiful lap quilt for my reading chair! Surely the weather will eventually get cooler in Texas and it would be nice to cuddle up with a good book under such beautiful fabric! I follow the Intrepid Thread on Facebook. I placed an order with them yesterday and can't wait to get my fabric!! Such pretty prints! Will work for all seasons. I follow you on Facebook and through your blog. Yours is my very favorite blog! Beautiful bundle. I would make a quilt for sure! Thanks! I follow Julie's Blog. Thanks! I pinned the giveaway- thank you! Fabric from Tule collection are great for dressmaking and I would love to sew a dress for my little daughter. My sister and I are heading to Destin, FL for Christmas this year. Have not been to the beach in almost a decade. My sister lost her husband this year and she wanted to do something non-traditional. I would love to make a lightweight lap quilt from this fabric .. it would be perfect for the beach! Thank you for the chance to win! I know I'd put Tule in a quilt, but not sure which pattern (there are so many "to do" patterns taped to my wall)! I follow you here and on FB! I follow you on Facebook! Your posts I seek out ... love your artistic flair! Thanks for another chance to win this fabulous fabric! I follow the Intrepid Thread on FB and their blog! I follow Intrepid Thread on FB ... love their posts and their fabric! I love those fabrics! I am working on some scrappy baby quilts and (always) on bags. I'm afraid I'd let it sit in my stash for awhile so I could just look at all those pretty colors! I Like The Intrepid Thread on FB. I follow you on FB and follow your blog. I'm not exactly sure what pattern, if a pattern at all, I'd use to make those lovelies into a quilt...and being from Reno, Nevada I'd love love LOVE those! I would make a nice lap quilt. I love this bundle! I'd make a quilt or clutches out of it! Thanks for the opportunity! Those are gorgeous fabrics! I've got a bit of a thing for orange and blue. I would make a lovely bright and happy table runner. Maureen, I love your "Bargello variation" idea, but I'm afraid this bundle would have to hang out on my sewing room shelf to be admired for awhile. It's just too pretty to cut up right away! I already follow the Intrepid Thread on FB. I "like" Intrepid Thread on Facebook. I love those colors! And my kids love orange and yellow too. They both need bags for dance class so it would be nice to put something together that stood out amidst all the pastel pink! I follow The Intrepid Thread by FB and newsletter. Love this collection. Thanks for the chance. I'd definitely make a quilt! I'm a longtime follower of The Intrepid Thread on FB. These are gorgeous! I'd make a quilt... maybe log cabin? I follow you on FB and will be sharing this to my fellow quilters, I wish we had such wonderful lines brought into Canada, the Local quilt stores only seem to bring in the tried and true! I also follow The Intrepid Thread, too. I'm such a follower, LOL! I have some placemats that need some perking up. These fabrics would help with that immensely! Thanks for a great giveaway! I follow intrepid thread on bloglovin! I'm making my first quilt right now using a blue and orange color combination. Thanks for the chance to win. I love the colours. I love blue and orange together. My mind is going crazy thinking about what I could make with this material. I follow the Intrepid Thread blog with Bloglovin. I'm spreading the word! I've listed this giveaway in the Giveaway Roundup post published today on my blog at www.missourimel.com. At this point, I'd probably just pet it as I have so much to do! I follow you on IG, FB, and bloglovin! such a pretty stack - looks great for a pillow cover in time for fall! I would love to make a patchwork bag out of this fabric! I follow Intrepid Thread on FB, and bloglovin. I love this fabric collection. Definitely, I would make a quilt. Goodness! How would you pick just one pattern? I'd love to make a gorgeous table runner with this fabric! Mmm Or a beautiful quilted bag! Journal Covers for my kids! Lots of ideas!! Your plan looks gorgeous! I'm not sure - definitely would make a quilt though! I'd love to make a quilt with the FQs, but I also want to get some Folklore - Terracotta yardage to make a skirt. I follow Intrepid Thread on FB as Margaret Glendening. I follow MC Handmade on FB as Margaret Glendening. 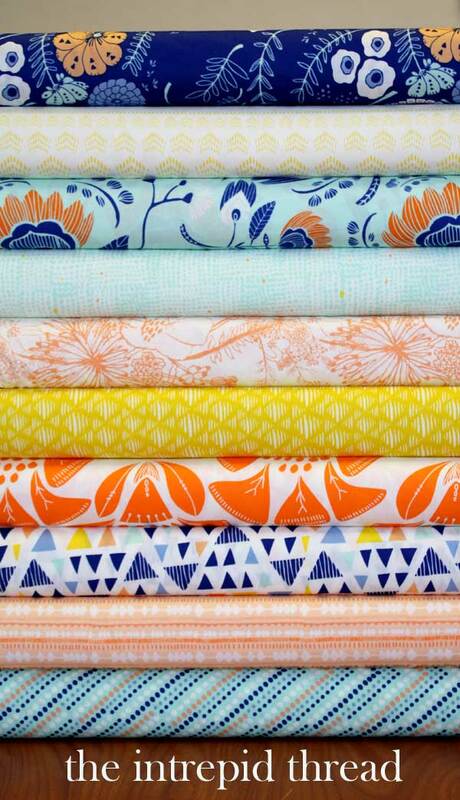 I've had Camille Roskelley's Swoon quilt pattern on my To Make list and this fabric would be gorgeous for it. Not to be redundant, but quilt quilt quilt!! The color are gorgeous! I now follow Intrepid Thread on Facebook! My best friend is having a baby girl... i'd definitely make a quilt for her new little one! I love the orange and blue and aqua together! That fabric is really bright and cheery. I'd make placemats. OMG I WOULD PROBABLY HOARD IT BECAUSE I LOVE IT!!! I follow the IP on FB! Love the colors....so probably a new quilt for myself! I follow you on FB and bloglovin;. :) Thanks for the chance. I think I would add the fabrics to my Molli Sparkles Broken Herringbone Quilt Along! They are fabulous. I have long been a follower of you Maureen on FB and Bloglovin. I would have to make a table runner and cute ruffled kitchen towels to match! Love these fabrics. I'd be making a quilt with these beauties. I've been drooling over this collection but have hesitated to purchase since I'm not sure what I'd do with it. I see it in my bedroom, though - - maybe shams or patchwork pillows. Your instagram photo & inspiration is really fantastic - can't wait to see it done! I am still a sucker for quilts. May be a beautiful quilt with lot of negative space for free motion quilting! I would give this to a friend obsessed with tule. I would add them to my stash and enjoy looking at them until I figured out who needs a gorgeous quilt made out of it! Just started following on Facebook. these fabrics are great! They'd make perfect cute little storage bins for me to organize all my sewing stuff! I'd make a patchwork weekender bag. I think it would be yummy! Maureen I love following your work on Facebook and Instagram! Just started following the Intrepid Thread on Facebook. Wouldn't these make a beautiful Swoon quilt?